You know that your organization’s procurement documents could use an overhaul. However, no one has the time to do it. Your in-house counsel is too busy, and hiring outside counsel is expensive and they are likely to only focus on the legal terms, leaving other aspects, such as supplier reporting processes, safety and environmental clauses untouched. Those on your procurement staff that could manage this are also the ones overloaded with other projects. So, the big overhaul gets put off for another year. This is where we come it. We do the heavy lifting to create clean, standardized, compliant templates and clause libraries. In this post, we describe how we do this work. We explain our approach, time requirements, team makeup, and a few other thoughts on the topic. The approach we use involves six steps that starts with analyzing existing solicitations and contracts, building template lists and style guides, drafting and editing document language, constructing the templates, populating a contract authoring tool and proving ongoing updates. Throughout all of this work, reviews with core and part-time team members are critical to ensure the content is as robust as possible. Below are the six steps in more detail. We begin by collecting procurement documents representative of each spend category. This includes solicitations, contracts, existing templates or clause library, and forms and attachments. 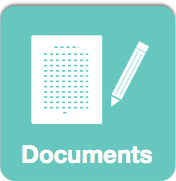 We review each document for consistency, structure, format, and clarity. Using what we learn during our analysis of existing documents and discussions with you regarding our findings, we build a list of the templates to cover your spend categories, looking to minimize the number of templates and clause variations. We also develop a common format for the templates including outline numbering, fonts, and other style elements and compile these into a style guide. We review the template list and style guide with you and make changes as needed. Using a combination of client documents and our Blue Burro Reference Set, we construct a master document containing all the clauses including clause variations. We call this compilation the “Clause Master.” We edit the clause language to make the writing clear, eliminate redundancy and conform to the style guide. We give each clause a unique number that allows us to refer to the clause independent of its title or placement in any template. We also highlight all variables within each clause. For example, where the duration of the warranty period may be specified on a contract-by-contract basis, we would tag where the warranty term would be inserted. We keep three versions of the Clause Master to facilitate reviews: (1) the original clauses compiled into one master (unedited), a redline version showing all edits made to the original clauses, and a clean version of the new Clause Master. We also construct a clause/template matrix. The matrix shows for each clause whether it is always to be included in the template or conditionally included. Conditional clauses are those that are added to a document depending on the specific circumstances of the document. For example, liquidated damages may be included in some, but not all, contracts. At this point, an extensive team review is conducted. We work face-to-face, virtually, or some combination of the two to facilitate these reviews. 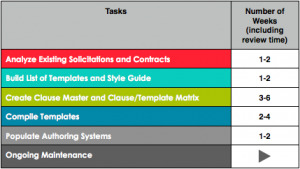 Upon completion of the Clause Master and Clause/Template matrix reviews, we update both based on the reviews and compile the set of templates. We send the templates to the team for review. When the clauses are arranged for each template, reviewers are often able to identify edits that they were not able to see when reviewing the Clause Master. We have found this two-part review process to be the most thorough and least time-consuming means of completing the reviews. The first review of the clauses as a complete set allows reviewers to focus on consistency of content. The second review allows reviewers to see master clauses in the context of category templates, allowing them to validate specific processes. For example, in a construction template, reviewers would ensure that the change order, project progress reporting and other processes that are defined in standard clauses are correctly stated. For conditional clauses, we include in each template the questions users will answer to determine if the conditional clause is included. We manage the reviews, facilitating where needed, addressing conflicting comments and producing a final round of templates and Clause Master. We obtain a sign-off of acceptance of all work produced from your counsel.For conditional clauses, we include in each template the questions users will answer to determine if the conditional clause is included. We manage the reviews, facilitating where needed, addressing conflicting comments and producing a final round of templates and Clause Master. We obtain a sign-off of acceptance of all work produced from your counsel. Whether using our document assembly solution or a third party’s application, we can configure the application for you with the new content. Some of our clients request that we maintain their clauses for them. We conduct regularly recurring issue review meetings where we list contract issues, and with guidance from you and your counsel, develop language to address them. We then incorporate the new language in the templates or clause library and any associated systems. Whether we are involved or not, monthly or quarterly meetings to refine document language is highly recommended. Total time to complete this work varies widely and depends upon a number of factors including how available client personnel are for reviews, team size, the number of templates (spend categories), the volume of standard negotiated position alternates, and other factors. The schedule below shows typical ranges. In-house counsel (attorney signing off on the work product for the organization). Person(s) who will administer the system and manage clause language going forward. One or two senior buyers (who handle complex contracts). Subject matter experts for functional areas such as accounts payable, safety, environmental compliance, HR and IT. The larger the core team, generally, the longer the project will take as scheduling reviews can become more challenging. We’ll assume that you have some type of document assembly tool. (If you don’t, you should, as the document preparation time saved is dramatic and the quality of documents increases tremendously.) Some document assembly systems (also called contract authoring systems) are based on templates and others are based on a clause library. It is our experience that more than 70 percent of any one category of contract is comprised of the same set of clauses. The remaining 30 percent of clauses vary from contract to contract. We’ll consider this question of whether clause libraries or templates are better from the point of view of three stakeholders: end-users preparing procurement documents; system administrators; and counsel, or others charged with signing off on the validity of the output. To the end user, the document is assembled based on answers to question, so it’s rather irrelevant to the end-user, both systems produce completed, compliant documents. To system administrators the answer is very application dependent. Clause library-based systems make language changes easy since all clauses are pulled from the library. However, the logic and interface to assemble the document can be very complex and for some software requires special system administrator training. Template-based systems may need the same language edits made across multiple templates, but logic changes can be made simply with an easy point and click interface. Lastly, it is our experience that counsel or internal auditors have a harder time becoming comfortable with the “black box” approach of the clause library systems. Some counsel and auditors have difficulty relying on the system’s ability to consistently produce compliant documents every time. Templates on the other hand, provide counsel and auditors with a single purpose document that can be reviewed in the context of the category being purchased and readily compared to ensure new documents are compliant. As Blue Burro is not a law firm, nor through this work are we providing legal services, all work must be reviewed and approved by your counsel.